This year is a special one for the Sikh community in the UK. Not only is it the 300th anniversary of the Guru Granth Sahib being installed as the Guru of the Sikh community, it is also the 100th anniversary of the first Sikh Gurdwara opening in this country and this book was commissioned by the Khalsa Jatha UK, more commonly known as Shepherds Bush Gurdwara to celebrate this double anniversary. The founders of the Khalsa Jatha were larger than life figures in a British landscape where no organized Sikh community or infrastructure existed. From the early students and educated elite of the Sikh society in this country to the Maharaja of Patiala, a frequent visitor to the UK and both an extravagant spender and a generous patron of the community a colourful story of hardship and a drive to found a focus for the sikh community comes to life. Teja Singh Mastuana, a Cambridge University student first laid the foundations of the first Sikh temple by initiating a Sikh religious gathering in 1908 in Cambridge. Sardar Narain Singh Sargodha, a barrister-at-law became the first secretary of the Khalsa Jatha and Hardit Singh Malik, one of the select few Indians flying in the Royal flying corps in the First World War was also involved. In 1913, the Maharaja of Patiala, on a shopping spree that included seven Rolls Royce cars helped fund a move by the Gurdwara to Putney in London. The book is well illustrated and includes copies of photos and documents never published before. Intriguing pictures of the early leaders and congregation captured in both formal and informal poses show the primitive conditions and the communal spirit and leave a lasting impression on the reader of a community in its formative years. They first arrived more than a century ago, a few students at Oxford and Cambridge from wealthy families and a trickle of pedlars who travelled across Victorian Britain, selling fine silks and jewellery from door to door. Sikhs in, those days must have felt far from home. And so, for moral support and to underpin their faith, religious elders in Punjab sent over five young men to spread the message of the Gurus. They leased a house in Putney, West London, to serve as a Gurdwara. It was the first such temple anywhere in Europe. And this weekend, its successor, the Khalsa Jatha as it was known, celebrates 100 years of the first Sikh temple in Britain. The small community's lucky break came in 1911. A student delegation met Maharajah Bhupinder Singh, the ruler of the principality of Patiala, who was visiting England on a cricket tour, coupled with the celebrations for George V's Coronation. They told him of their need for a centre in London that could serve as a rest home for Sikh visitors and also a place of worship. Impressed, the pious maharajah immediately offered £8,000 — a huge sum then — which secured a 99-year lease on the Putney house. Weekly services were held on Sundays, and the Maharajah used to visit when he was staying at the Savoy, his London base. In 1913, while on a shopping spree (which included seven Rolls-Royce Silver Ghosts), he obtained a new lease on more suitable premises in Sinclair Road, West London. An association, named the Guru Khalsa Foreign Mission, was created, with a seven-member executive committee set up in April 1914. One of the driving figures was Teja Singh, a gifted student who became the first turbaned Sikh to enroll at the University of Cambridge. He spent 18 months at Downing College studying natural sciences but also devoted much time to preaching the tenets of the Gurus to fellow students. He gave regular talks on Sikhism. There was an undercurrent of national pride and leaflets were distributed calling on Sikhs — one of the last peoples on the sub-continent to be subjugated in the 19th century — to agitate against British rule. Teja Singh remained president of the London gurdwara until he left England. By 1913 the management of the institution was more ambitious and took up the Sikh cause throughout Western Europe. The London community numbered more than 100 and organised a committee of students to go to Britain's ports and stations to welcome newly arriving Sikhs and direct them to the gurdwara in London where they were helped to find homes. One of the aims was to rekindle religious feeling in those arriving: many, perhaps intimidated by the hostile stares and laughter that greeted them in England, used to cut their hair and adopt European practices. With the outbreak of war a large number of Sikhs arrived from India to fight on the Western Front. Their disproportionately large contribution to the war effort has since been recognised in official memorials. Many of the wounded Indian soldiers were sent to makeshift hospitals in England, and the Government paid for them to see the sights of London as part of their convalescence. More Sikh traders began to arrive in the 1920s and 1930s, and for the first time some were accompanied by their womenfolk. The beginnings of a permanent community in East London were being laid. Prominent academics, barristers and Sikh businessmen were also beginning to make a name for themselves. But they retained their links to the gurdwara — and the tradition of communal meals, offered free to anyone who attended the temple, kept the community together. That tradition lives on in every gurdwara today — and there are now some 250 in Britain, serving a community of around 400,000. The community was also caught up between the wars in the vengeance wreaked on the British governor who had ordered the notorious Amritsar massacre in 1919. Udham Singh, himself a survivor of the killings, arrived in Britain in 1933 with the intention of killing the perpetrators, and moved into the Shepherds Bush gurdwara. His target was General Reginald Dyer, who had commanded the troops, but he had already died. Instead, he sought out the former governor of Punjab, Sir Michael O'Dwyer, who had given the orders for the massacre. On March 13, 1940, Udham Singh walked into Caxton Hall, where O'Dwyer was attending a meeting, and shot him dead. He was swiftly arrested, tried and hanged. By the end of the Second World War Sikhs had begun to settle elsewhere in Britain, particularly port cities such as Cardiff, Gravesend, Edinburgh and Glasgow. Sikhs contributed to the agitation for Indian independence, but were aghast at the British decision in 1947 to partition India. The division ran through the middle of Punjab, the Sikh homeland, and hundreds of Sikhs demonstrated in London against Partition. Immigration from the sub-continent peaked in the 1960s. Sikhs were among the arrivals, and quickly tested British law by challenging — and overturning — the bans on wearing turbans as part of their uniforms on the buses or when riding motorcycles. The temple in Shepherds Bush was becom¬ing too small, and a new site became available nearby in 1964. The commu¬nity bought a derelict former Salvation Army centre, and set about rebuilding it as a temple. Hammersmith council, however, had wanted to take over the site with a compulsory pur¬chase order and tried to halt the work. Some 200 Sikhs, armed with picks and shovels, promptly marched through Shepherds Bush to begin work, insist¬ing they had prior planning permission. Hammersmith backed down, and the present temple in Queensclale Road was officially inaugurated on December 7, 1969 — an auspicious occasion that coincided with the 500th anniversary of Guru Nanak Dev's birth and the global celebrations of this religious landmark. The theme has since been enlarged and refurbished, and has set up a youth centre, classrooms and a small museum inside to record the history of Sikhs in Britain. Ironically, as the area has been gentrified, all but the richer Sikhs have moved away. It is still a magnet for many, however, and featured in the film Bend it Like Beckham. 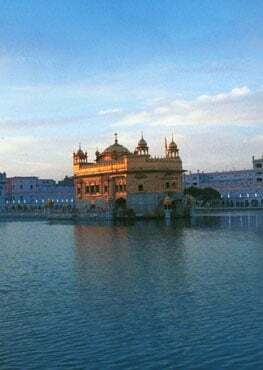 Peter Bance, a Sikh historian who has written extensively on the community in Britain, has produced this book, Khalsa Jatha, British Isles 1908- 2008, on the Gurdwara and will join the many Sikhs who will be celebrating in London this weekend. 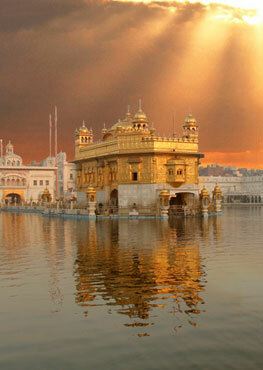 Auspiciously, the anniversary coincides with the 300th year of the installation of the Siri Guru Granth Sahib.